Happy Mother's Day to all you mothers (present & future) out there. I hope you all got some nice appreciation from your kids/husbands. I did not get the one thing I wanted. To sleep until noon. It was nice to have Mickey home for the morning since his meetings were cancelled so the men could be home to help out. Other than him being home the day was going pretty much like normal; someone doesn't want to comb their hair, put on certain clothes, or just dawdles until it's time to go making me a little grouchy. We had to get to church a little early because the woman's choir I'm in was performing today and we had to run through our song. That went well. At some point towards the end of Sacrament Meeting I look over and see Kade like this. Thank goodness for Mickey's iPhone. I know it's not the best picture but when would I ever catch him doing this again? Probably never, since the compact is not mine. Mattey and Kade were both digging in Nana's purse finding things to keep them quiet. Maybe that's what I need to do, carry an extra purse full of all kinds of things for them to get in to. 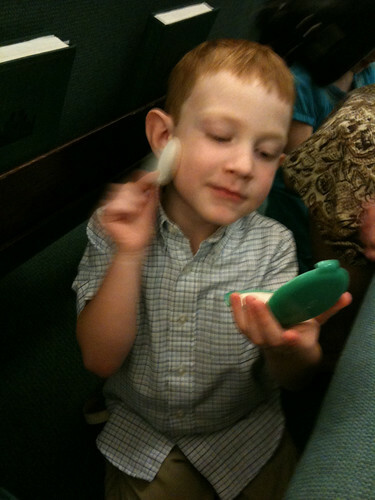 What do your kids do to keep quiet during church?